Draft Barn in Gowanus is one of those places where you want to go for good beers, super knowledgeable bartenders, fried croutons and loads of space. 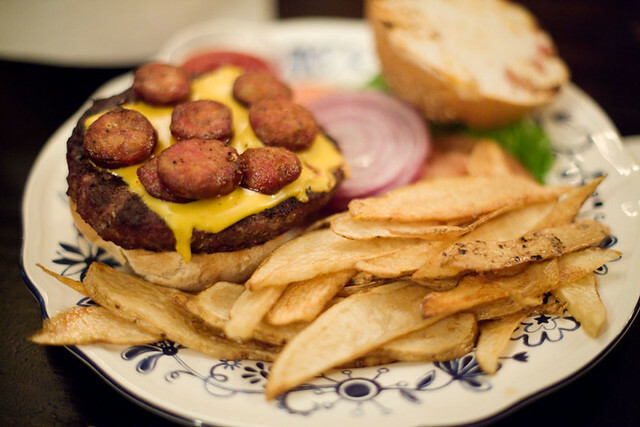 OR maybe spicy Hungarian sausages in your burger. Well Draft Barn has that. Let me introduce you to the Draft Barn Burger “1/2lb charcoal grilled beef patty, slice of American or mozzarella cheese, pan fried sliced mild or spicy Hungarian sausages served on a kaiser roll.” Served with lettuce, tomato and fries. I actually don’t really like their fries because they are more like chips. Flat fat slices of fried potatoes. Thank goodness their burger was solid. Cooked medium just the way I had asked and it was just a good tasty burger. Though too bad the spicy sausages weren’t spicy at all and kind of got lost in the patty, lettuce and tomatoes.